Between August 23rd and September 2nd2012, refugee activists and other activists of anti-racist groups followed the call of THE VOICE Refugee Forum and the Caravan for the Rights of Refugees and migrants: they came to the BREAK ISOLATION refugee summer gathering 2012 in Erfurt, Thuringia, Germany. Through a rally at Erfurt Central Station that targeted racist police controls, refugees and refugee activists gave a clear signal against residence obligation and deportations. Discussions about imperialism and colonialism gave us a broader collective understanding of mechanisms of oppression and division, but also of our role as refugees and non-refugees in the fight against colonial injustice here in Germany. In our everyday struggles, it is essential to debunk the form of history that was written by those in power and their lies by telling the truth about exploitation and dominance structures, to unveil the cruelty and destruction committed by the system. During both days of the first weekend, the first meeting especially for female activists (refugee and non-refugee women)within the Caravan network took place. They decided to organise the first refugee women's conference in spring next year and will intensify their attempts to inform women in isolation camps about it. The refugees' march from Würzburg, Bavaria to Berlin began on September 8th 2012. This protest is a clear statement against residence obligation (Residenzpflicht), the law that stops refugees from leaving their district without permission, turning every German district into a prison without walls. It began in Würzburg, after Mohammad Rahsepar took his own life on January 29th 2012. He hanged himself by his own hand - but his murderers are those who kept up the camp system despite refugees' decade-long protests. His young neighbours from Iran didn't want to end like him and others who were mentally broken after years of living in an isolation camp. The evening before the beginning of spring, they stepped out on the street and started a strike in Würzburg, which still continues today. They left the isolation camps behind and chose to resist. In Würzburg they demonstrated their determination by actions, hunger strikes, thirst strikes, and sewing their lips shut. We are the voice of all the asylum seekers who demand their right. We shouted loudly, but nobody heard us. Now we have sewn our lips shut, for everything has been said. Their protest for the closure of all camps and complete abolishment of the residence obligation was joined by refugees elsewhere and continued in tents. Tents were erected in the German towns and cities ofAub and Bamberg (both Bavaria), Berlin, Düsseldorf (North Rhine-Westphalia), Nuremberg (Bavaria), Osnabrück (Lower Saxony), Passau and Regensburg (both Bavaria). In order to bring together all protests and mobilise more refugees, the refugees went on a march to Berlin on September 8th 2012. On their way, they visited refugees in isolation camps and declared their contempt for the residence obligation in every district. 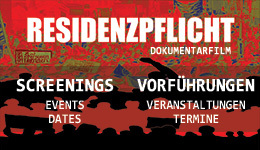 Call for Refugee Protestmarch Würzburg Berlin from The VOICE Refugee Network on Vimeo. During the first weekend of our BREAK ISOLATION refugee summer gathering here in Erfurt, we discussed the march with the coordination council of protesting refugees in tents and many other refugee activists. The march is actively supported by refugee activists from THE VOICE and the Caravan network. All possibilities will be used to inform refugees of the action. In the federal countries of Thuringia and Sachsen-Anhalt, THE VOICE Refugee Forum will strengthen the march through actions, through political input from their fight against camps and through providing infrastructure. In North Rhine-Westphalia, the local groups of the Caravan for the Rights of Refugees and Migrants in Wuppertal and Bielefeld and other anti-racist and anti-fascist groups will provide organisational support for the bus tour. The most important goal of this action was named by members of THE VOICE Refugee Forum during a meeting with the coordination council of the protesting refugees: during this march we must all work to integrate the refugee struggles and work even more as a unit. It is extremely important for the continuity of our work to consider the experiences we have made during our struggles. This was put into practice during the ten-day refugee summer gathering.At the gathering, refugees who recently got to know the Caravan network and THE VOICE Refugee Forum gained practical and theoretical knowledge through discussions with each other and with refugee activists.There was a critical analysis of our understanding of isolation, but not only the isolation of refugees but as well of their struggles in the current dominance and hierarchy structures. Our practical knowledge was extended through two visits to the refugee camp in Breitenworbis, Thuringia. Refugees from the Breitenworbis camp joined the gathering and spoke about the threats they had received from the authorities (the social welfare office, the migration office (Ausländerbehörde), the caretaker and the police).We spontaneously organised two delegation trips. During meetings in the Breitenworbis camp, theofficials and organs of oppressionhad to face our physical presence.During those visits it was made clear that from now on the refugees and refugee activists would monitor and control the operators of the camp. The visits mark the beginning of a common campaign for the closure of the camp. Inhabitants of the camp, along with THE VOICE Refugee Forum, called for a rally outside the migration officein the town of HeilbadHeiligenstadt, Thuringia on September 11th 2012. During the first days of the current Break Isolation Camp there were no provocations by state officials.Individual attempts to control people at the central station in Erfurt, which were based on racist motives, could be stopped by resolute intervention of the people concerned.After our visits to the refugees in the Breitenworbis isolation camp, activists from our network were controlled one evening. One person was threatened with jail without any legal basis whatsoever.Those controls were condemned in a strongly worded public declaration.At the same time, people from the camp carried out a control of the Federal Police (Bundespolizei) at Erfurt Central Station. They made sure not to use more resources than necessary so the program of the gathering would not be neglected because of the police provocations.Practical ways of dealing with racist controls were worked out in discussions. During the camp it became clear that self-organisation requires time and space.Our experience of fighting and our common work on our history, far from what is taught in text books and state propaganda, will help us to make our confrontation with the means of oppression concrete.Our fight against individual aspects of oppression must be accompanied by the unveiling of exploitation and dominance structures.In order to impeach this colonial and racist system, there will be aninternational tribunal against the Federal Republic of Germany in summer 2013. It will take place in Berlin from June 13th to 16th.Our daily struggles and every action will be strongly defined by our physical presence. We ask everybody to provide the refugees and migrants in your neighbourhood with the results of the BREAK ISOLATION refugee summer gathering in 2012: the short film ‘Embryo of Freedom’, which will be published shortly, this text and all other texts and contributions. BREAK ISOLATION -- Refugee Summer Gathering coordination network: Caravan network and refugee initiatives in the federal state of Thuringiaand the towns and cities of Wuppertal (North Rhine-Westphalia), Hamburg, Berlin, Möhlau (Sachsen-Anhalt), Hanover (Lower Saxony), Augsburg and Würzburg (both Bavaria).